The production of sparkling wines protected by the appellation of origin was referred for the first time in La Mancha through its new regulation, adopted in July 1995. 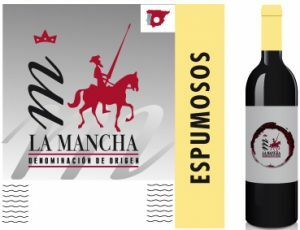 Currently, a sparkling from La Mancha is an excellent wine of the variety proceeding from Airén or Macabeo, or a mixture of both varieties, to which a small amount of sugar and special yeast is added. Sparkling wines with Designation of origin La Mancha may be: dry, semi-dry, sweet, extra-dry and extra-brut. We can say that the sparkling wines of La Mancha are usually white, pale and bright, with foam comprised of small and persistent bubbles. Its aroma is fruity and clean. The taste is fresh and balanced, with wide, clean retronasals. They are prepared by the traditional method and must have at least 9 months of bottle aging.